instance, responding to a question about surveillance with rantings about employer/employee AIDS relations. 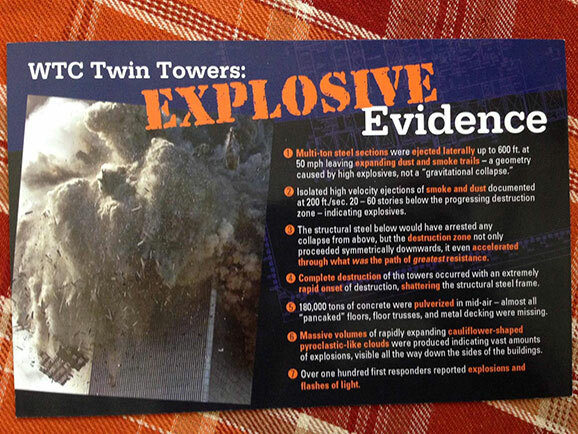 “There’s only so many times you can watch Building 7 fall,” says Abel. Ross and I agree that that’s a good point. lead us into war. The DVDs are full of barely related details and wild assumptions. We try to broach a couple of them during the meeting. obvious!” It becomes clear that this group has grown so accustomed to incredulity that scoffing is their default. Counterpoints fly past unnoticed. Two hours later, the room has dissolved into a shouting spree that I cannot follow to save my life (which, at this point, I’m not sure I want to save). The man next to Ross and me, who is sporting cargo shorts and no shirt, shakes his dreadlocks at us. “They’re just MURDERERS. In a CEMETERY!” he says. I give him a tiny smile, hopeful that this will end our interaction. Ross visibly pretends not to hear. narrow on me. It’s the twelfth hour they’ve spent with us, but they seem to have just noticed us, like a smell creeping through a closed door. “What’s your background, anyway? What do YOU think happened on September 11th?” asks Abel. All eyes turn to us. We’ve been found out. 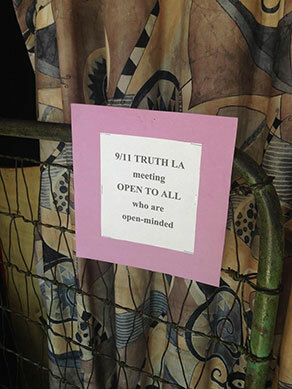 we really didn’t know much about the Truther movement or about the alternative 9/11 theories. “We’re just here to learn,” we said. “Great! We love young people!” Abel responded. arrived, Abel barely recognized us. like me, which is not an option. It’s very important that everyone I’ve ever met likes me. “Well, I’ll admit, I’m not entirely sure,” says Ross. independent agents. Everyone else studies Ross. “I would need to hear more evidence,” he says. But the dreadlocked man next to Ross is still staring us down. You’re not welcome here, he says with his eyes. I go to buy a sandwich. lying down on benches along the back wall where they can’t possibly read the subtitles. One is snoring. Time passes so slowly here. I look at my watch. 2:29. I look at my watch again twenty minutes later. 2:34. I go out for some air. Outside, I kick around some rocks and leaves and call my friend Chris. I get his voicemail. On my way back in, someone stops me. “What’s that?” he says, pointing at the curtain that divides the Truther meeting space and the rest of the coffee house. “Oh, it’s a 9/11 Truther meeting. Like, questioning the official story of September 11th,” I say. It is twenty minutes later. They are still watching the Putin video. When the video is finally over, Abel turns the lights back on just as someone rushes in from the outside. Everyone runs out the door, where we find a mobile billboard being towed down the street. 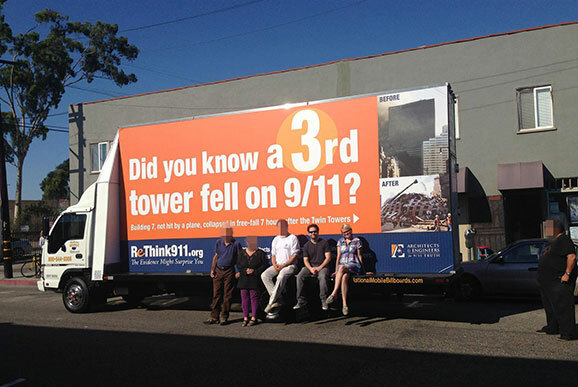 “Did you know a third tower fell on 9/11?” it asks. Ross and I eagerly climb aboard the truck and ask for a group picture. Only a few people join us. The others stand on the sidewalk. An hour later, we go home. We never go back. Carrie Poppy is the cohost of the investigations podcast Oh No, Ross and Carrie. She regularly writes and speaks on social justice, science, spirituality, faith, and claims of the paranormal. She also performs, mostly in funny things. She only has one fully functioning elbow. Myth Check: Was Hitler a Vegetarian?